Dialogues in Social Justice: An Adult Education Journal is seeking scholars to review manuscripts for our upcoming themed issues: White Supremacy and Privilege in Adult Education and Social Media, Adult Education, and Resistance. If you would be willing to serve as a reviewer or know someone who might be willing to serve, please contact the editors at dsjadulteducation@gmail.com. As adult education practitioners, we cannot help but acknowledge the presence of social media within society and its impact on our adult students. Social media has become a staple in the everyday lives of many people. Social media has been revolutionary in promoting social justice issues such as: Black Lives Matters, the Me Too Movement, United Airlines’ boycotts addressing passenger treatment, autism awareness, American elections, as well as the Arab Spring Movement. Given this rise in the dissemination of information through the use of technology, social media has challenged the traditional methods of pedagogy within adult education spaces, and has pushed us to examine the ongoing role of social media in addressing social injustice. DSJ will publish a themed issue focusing on Social Media, Adult Education, and Resistance. This themed issue seeks to explore the role social media plays in: promoting or challenging social injustices within adult education; resistance to the use of social media within pedagogy, the use of social media as an instructional tool, and how and where social media has been used in the service of social justice effectively. 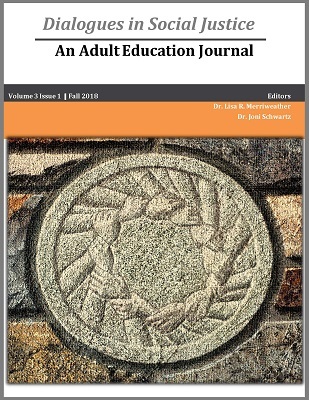 Dialogues in Social Justice: An Adult Education Journal invites proposals for this upcoming themed issue: Social Media, Adult Education and Resistance will a planned publication date of February 2020. The current issue of Dialogues in Social Justice: An Adult Education Journal is now available.